Complete craft kit for children ages 7 . 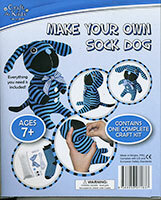 Contents include everything needed to sew a cute sock dog. Includes: socks, stuffing, ribbons, thread, a needle, buttons, and a bowknot.